“To encourage the advancement of the education and training of those working in social services, teaching and healthcare, in a paid or voluntary capacity, who seek to increase their skills and understanding in the field of human relations”. The idea for the Trust was born out of a concern over the number of people who were indicating financial constraints prevented their taking up training or personal work at the The Scottish Institute of Human Relations (SIHR). 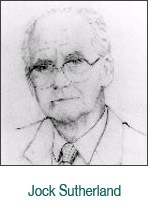 Formed in association with SIHR as “The Social Workers and Allied Professionals Trust Fund” it eventually became “The Sutherland Trust”, in honour of Jock Sutherland’s work in Scotland. Jock, who had declared himself flattered and honoured at the use of his name, died shortly after this so did not see the Trust later launched as an Independent Charity in its own right in October 1993. The drawing shown above was created for the Sutherland Trust by Iain Haeburn-Little.